It’s been a decade since Ralph Peters’ provocative text about “Blood Borders: How A Better Middle East Would Look” was published in the US’ Armed Forces Journal in summer 2006. In hindsight, this document wasn’t just a theoretical suggestion, but a guiding blueprint in the US’ quest to break Brzezinski’s “Eurasian Balkans” along distinct identity lines in order to facilitate its divide-and-rule hegemony by the unipolar world. Ten years on and after the seismic geostrategic shifts that have taken place during this period, it’s time to offer up a substantial counter-vision to Ralph Peters and propose a multipolar blueprint for integrating the “Eurasian Balkans” and strengthening its multipolar New Silk Road connectivity. The following is by no means comprehensive or utopian, with it being taken for granted that detailed research must be undertaken by the appropriate expert, governmental, and infrastructural entities in exploring the viability of each projected route and network. In erring on the side of caution, it must be assumed that most of these projects will not work out for a myriad of reasons and will likely not see the light of day, but for those that do end up being put into service and realized, then they may take highway, railroad, or multimodal forms. The goal of this study is to establish the full range of the most likely and effective connectivity potentials in the “Eurasian Balkans” and brainstorm innovative ways in which the New Silk Road and other complementary integrative initiatives could fundamentally transform this region’s fractured geopolitics into one of multipolar unity and win-win economic benefits. This former Ottoman-era rail line was closed in 1920, though the geostrategic underpinning behind it hasn’t changed a century later. In fact, it’s even more important than ever and could actually hold the key to Syria’s successful post-war reconstruction. The Aleppo-Damascus-Amman-Aqaba line is pivotal for promoting north-south trade in the Levant, and the branches to Latakia and Beirut provide an outlet to the Mediterranean Sea. There might not be much of a real-sector economic imperative on the Saudi side to connect to Aqaba and thus deeper into the Levant because of Jeddah’s existing port infrastructure, though it can’t be discounted that this route might one day become attractive to the Saudis as they anxiously try to diversify their economy away from its natural resource dependency. Hejaz 2.0 has the potential to pivotally connect Damascus to Baghdad after the defeat of Daesh, and to an extent, thus link Beirut with Tehran as well. As the Saudis deepen their influence over Jordan and predictably incorporate it into the GCC in the next decade, they’ll want to ensure that they have full connectivity with their new partner. Accordingly, Riyadh might then spearhead a trade route (whether via highway or rail) directly to Amman, and the strategic consideration of tethering Jordan ever closer to the Saudi monarchy might also serve as a driver for expanding Hejaz 2.0 from Aqaba to Jeddah. Continuing along this train of thought, before the Saudis contemplate any external projects outside of the GCC, they will likely first focus on linking together the space within their own borders. The Saudis have made a big deal about their intention to economically diversify, though it’s understood that the financial, real estate, and consulting sectors (what most observers expect to be the emphasis of this new economic policy) won’t be sufficient enough to ensure full employment for the population. Instead, the Saudis will have to also branch out into retail and light manufacturing, which therefore gives them an incentive to develop their national infrastructure. Paved roads already exist inside the kingdom in order to accommodate the import of goods to the capital, though this might be expanded in some capacity to more solidly link the western port of Jeddah with its eastern counterpart of Dammam along the GCC Corridor. There are already pipelines spanning this expanse, so it’s sensible that more inclusive infrastructure projects will follow the route that the energy companies already charted. The GCC states plan to build a railway linking each of them, and in light of their proactive post-oil real-sector development plans, it’s likely that this ambitious and costly project will in fact end up being constructed despite the numerous delays and complications that have come up since its 2011 announcement. The plan is connect the coastal space between Kuwait and Muscat, though the tangential possibility exists for several complementary branches as well, whether they’re rail or highway routes. The first and most obvious one is for the project to reach Bahrain through the Saudi coastal city of Dammam. From there, Qatar could link Bahrain and the UAE via two separate causeways, though the Saudis will of course object and do whatever they can to prevent them from being built out of the fear that former rival Doha will usurp Riyadh’s influence over these two states. Nevertheless, because it’s these routes are possible from a technical standpoint, they deserve to be mentioned just in case the strategic situation changes in the future and they become politically viable. From Abu Dhabi, two paths become available. The first one goes to Dubai and then either to the UAE port of Fujairah and/or to the Omani capital of Muscat, while the second one goes directly to Duqm, the newly developed port that China is decided to invest in as part of its One Belt One Road global strategy. Either way, it’s realistically planned that a Dubai-Muscat-Duqm route will one day be forged, and then the path would continue southwards to the Omani Kingdom’s second largest city of Salalah. It would make sense to link Aden with Muscat and thus join the GCC Corridor with the Cross-Continental Line, but even if that doesn’t happen, it’s very likely that the Saudis will seek to connect Jeddah to their southern neighbor’s most important port. This may or may not be as part of an expanded Hejaz 2.0 vision. No matter which form it takes, though, a bridge over the Bab el Mandab could connect the GCC states to their Ethiopian agricultural supplier via Djibouti, going through the third-largest town of Tadjoura (and the largest in the sparsely Afar-populated northern reaches of the country). Moreover, as Ethiopia rapidly develops its economy, its textile and industrial exports could also pass over this bridge en route to the profitable Gulf markets. Iraq’s function in this regional matrix is to link together the Mediterranean and Iran, and the Gulf and Turkey. The country is also a sizeable market in and of itself, and it would be wise to maximize its central geographic position to capitalize off of the intersecting trade routes that it occupies. Basra would join Iraq to the GCC Corridor the Islamic Line in Iran, thus giving it yet another chance to facilitate trade between two large markets all while earning a handsome profit if it played its cards right. The concept for this $46 billion trade route is very simple, and it’s just to connect western China to the Indian Ocean port of Gwadar. Xinjiang’s regional capital of Urumqi is the primary node in this network, though in going south towards the Pakistan, it must pass through Kashgar, through which it could eventually link up with the Kygyz Fergana Valley city of Osh if Beijing ever decided to construct expensive mountainous transportation infrastructure to achieve this. Continuing along, though, Islamabad is the central jewel of this economic crown, and the Pakistan capital also gives the project the potential of integrating Afghanistan as well, via the Kabul Corridor (though only in the event that transnational Pashtun violence can be controlled). Islamabad should find a way to incorporate the regional Baloch capital of Quetta into this ambitious transnational framework, since that the eventual development that this project could bring would go a long way towards dissipating separatist sentiment there and quelling the resentment that some of the peripheral locals have because of their historical neglect by the center. It would be a smart move for Quetta to be brought on board because it could then directly join with southern Afghanistan’s Kandahar and the rest of that country’s proposed transport network. Quetta could also then be connected to Gwadar and the Pakistani coastal hub of Karachi, both of which would enormously contribute to Baloch capital’s development and possibly help quell the regional insurgency there with time. 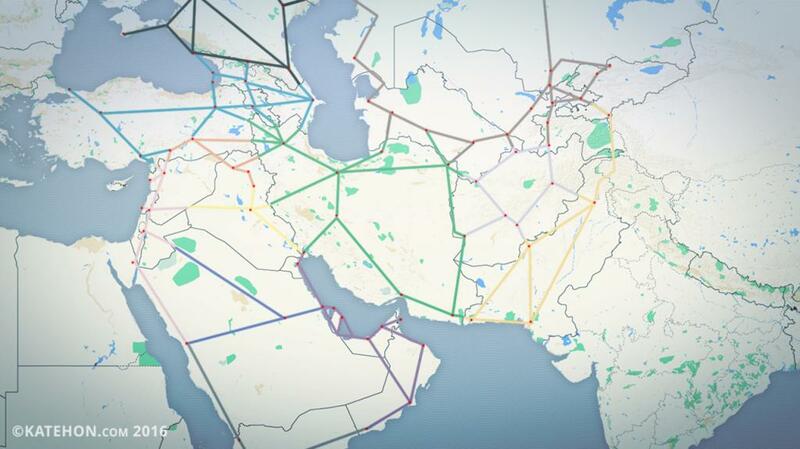 The last part of the Mideast-Russia-Central Asian-South Asia interconnected infrastructure grid to be discussed is the portion that’s crucially expected to run through Iran. As was already discussed, the northeastern city of Mashad is in an envious geographic position of allowing access to the east Caspian rail route, the Tashkent line to the populous Fergana Valley, and the eastern corridor to Kabul and Islamabad, the latter path of which also links it to the national capital of Tehran. The other advantageous that this city has, though, is that it’s the most logical transit point for India’s Ashgabat Agreement plans for using the port of Chabahar as its entrance point to the Central Asian marketplace. In between the two cities is Zabol, which is the Iranian counterpart of Afghanistan’s Zaranj that leads to Kandahar via the Indian-constructed highway. Moving westwards in the Islamic Republic, Chabahar could be effortlessly joined to Bandar Abbbas, Iran’s most currently significant port, after which it could connect to Isfahan before either circling the Persian Gulf to Iraq’s Basra and the GCC Corridor that starts in Kuwait City, or venturing north to Tehran. The Iranian capital also links to the border town of Gorgan that ties the country’s commercial heartland with the east Caspian railway. Tehran’s other connective importance is that it is close to Tabriz, which is impressively has the potential to serve as a hub in expanding Iran’s trade ties with Baku, Yerevan, Erzurum, Diyarbakir, and Iraq’s second-largest city of Mosul. * India’s Chabahar-originating North-South Corridor has the potential to branch into Russia and the EU (via Azerbaijan), Central Asia (via Turkmenistan), and Afghanistan, thus giving it flexible connectivity if the proper infrastructure can be constructed and maintained. * It’s unlikely that the proposed Afghan projects will see any tangible progress in the near future, but the vision of economic integration and the country’s role in facilitating Iranian-Pakistani trade could serve as a win-win motivation for its internal stakeholders to get their act together and hash out a political compromise (as well as for their external backers to pressure them enough to do so). * The most commercially effective route in linking China with Iran runs through Central Asia, but it’s also the most geopolitically complicated because of its transit through the Fergana Valley. In the event of a rapid succession of leadership changes in Kazakhstan, Uzbekistan, and Tajikistan (whether through old age or Hybrid Wars), this center of regional gravity could promptly become ground zero for terror, insurgency, and destabilization. While the trans-Central Asian route has the potential to yield a very high economic return, it also carries with it equally sky-high risk for the time for the foreseeable future. * Iran instrumentally sits at the crossroads of numerous future trade routes, be they as relatively ‘local’ as Tehran-Beirut or as broad as Islamabad-Istanbul. Furthermore, no country can functionally replace Iran in terms of its importance to China’s mainland One Belt One Road vision for integrating with the Middle East and establishing a Southern Eurasian Corridor to the EU to complement the centrally positioned one through Russia and the northern maritime one via the Arctic Ocean. * Tabriz has the most diversified connectivity potential of any of the researched nodes, with the opportunity to link up with Tehran, Baku, Yerevan, Erzurum, Diyarbakir, and Mosul. 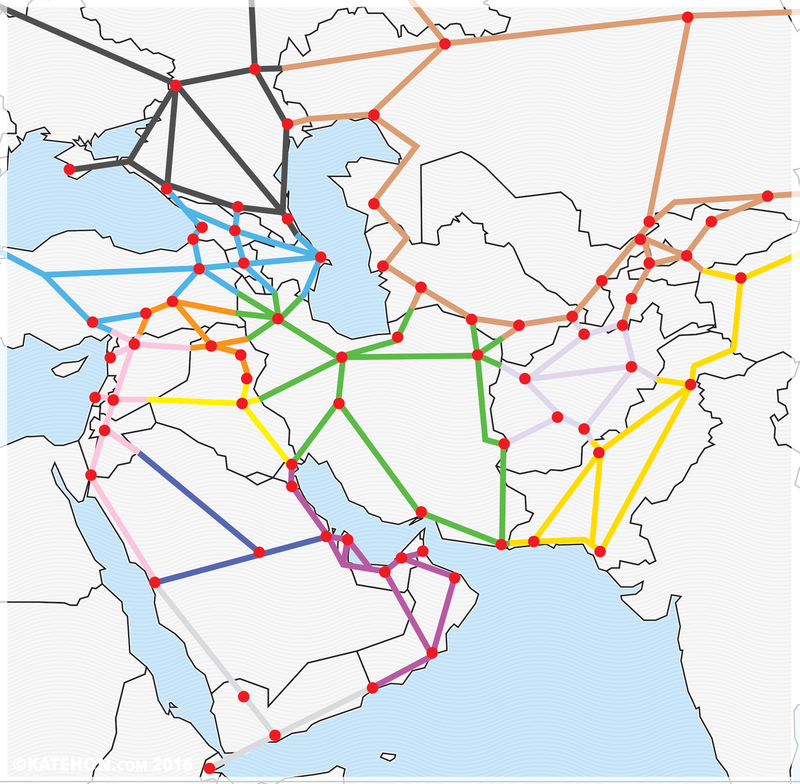 * Iran’s connectivity with Istanbul and Beirut is functionally dependent on the stabilization of southeastern Turkey (“Kurdistan”) and the Syrian-Iraqi border region (Daesh), without which it is impossible for Tehran to fulfill its multipolar geo-integrational destiny along the New Silk Road. It shouldn’t be seen as a coincidence that both of these regional disturbances are linked with one another and also connected to the US to various degrees. * The Qatari-Saudi rivalry has largely cooled off ever since both sides ‘reconciled’ in late-2014 following Riyadh’s strategic heavy-handedness against Doha, but if the House of Thani somehow manages to establish direct transportation ties with Bahrain and the UAE via the two previously examined causeway proposals, then they’ll succeed in snubbing the House of Saud and breaking these two kingdoms away from its predominant influence, though most likely not without some of preceding conflict taking place (to whichever degree it manifests itself in).